Throughout the year, I often find myself thinking about how I really need to buy myself a new sheet pan, or how I have to replace that flimsy spring-form pan. You might also have some long-loved baking pans or utensils that have seen better days. Stop thinking about it, and do it! Go through your supplies, pulling out anything that needs to be replaced, and then head to the store for new ones. I recently got myself 3 shiny new sheet pans (my old ones were warped and dented), a couple new square baking pans to replace the ones that had gotten a little rusty, some fresh new spatulas, and a cookie scoop. 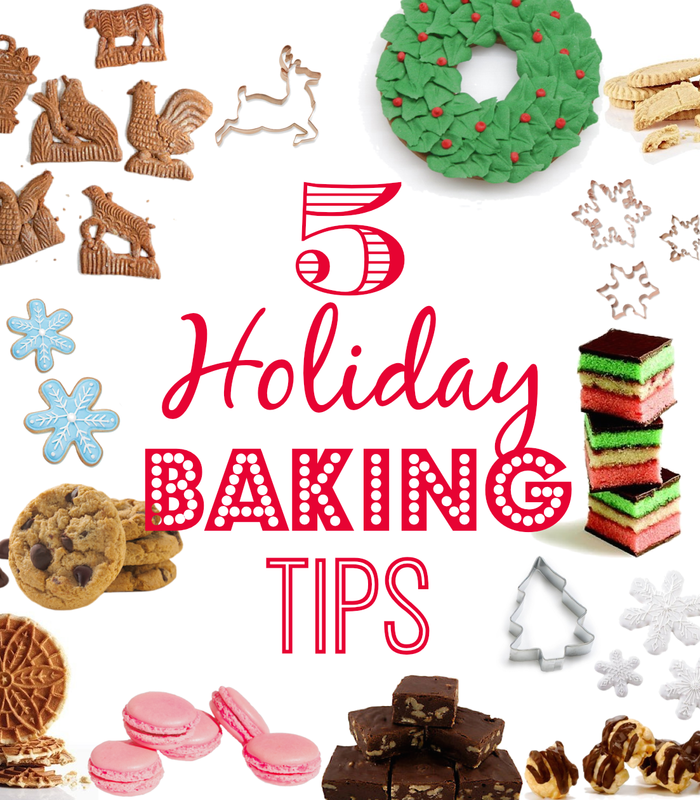 You already know about the flour and butter and sugar, but think about what other things you can add to your holiday baked goods! Some of my favorite garnishes and toppings include red hot candies, sprinkles, coconuts, cacao nibs, chopped nuts (like these fun pecan chips), candy bits, marshmallows, and dried or fresh fruit. Think about ways you can mix up your old recipes with fun new simple swaps (like replacing raisins with dried cherries or candied orange bites, or adding chopped pecans to your favorite banana bread.) It's even a great way to make two completely different sweets from one recipe (just split up the dough and mix in different items. Double the sweets without doubling the work! If you're planning to give away some of your baked goods as gifts, remember to buy items to wrap them up in. Sure you can do a simple paper plate covered in shrink wrap, but think about other fun ways to package up edible gifts. I love raiding the dollar and craft stores for inexpensive tins and baskets. A pile of fudge on a plate is awesome, but a pile of fudge in a cute holiday tin? I stock up on wrapping supplies that work outside of the holidays (like plain colors, brown butcher paper, or items that have a more general winter, but not specifically holiday, theme) so that I can use them for easy hostess or birthday gifts throughout the year. They're also a great way to send people home with holiday or party leftovers! Also remember things like ribbons, stickers, gift tags, and other embellishments to make your gifts look even more special. They're also great to pull out in case of surprise guests or last-minute invitations (aka instant hostess gift!). (Also a good reminder to stock up on freezer bags and containers to store your extra goodies). 5. Shop the sales for next year! This is probably my favorite thing to do. Take advantage of those amazing post-holiday discounts to stock up on goodies for next year's baking! Load up on sprinkles, peppermint candies, and other treats that would be great for decorating. Also check out discounts on baking pans, silicon mats, and everything you need to wrap and decorate edible treat packages. You can package these all up, and next you're you'll be way ahead of the game! What other things do you do to save yourself time when baking for the holidays?